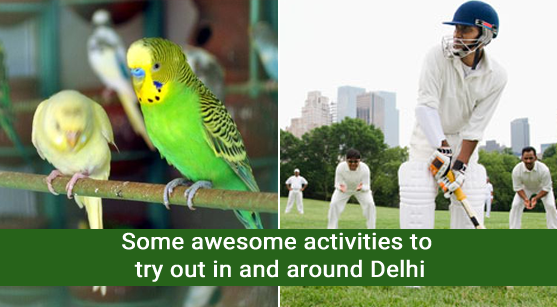 Delhi,in itself, is one of the best places in the country to try out some fun and awesome activities. In fact, there are various places surrounding Delhi also that allow you to take part in some cool outdoor activities. The best part about Delhi is that you get numerous tours and trips through various corners of the city. You can take the Delhi one day tour to explore some of the most important points and places of the city. You can try out the food walk through the alleys of Chandni Chowk or you can go on a trip through various famous monuments of the city in a private car, or you can simply roam about the city streets, soaking in the life of Delhi! Come what may you will never run out of activities to take part in when visiting the capital of the country. Hit the road: The road trip from Delhi to Jaipur is one worth taking. Head out in the winter mornings from the capital to Jaipur. Dewy fog will cover all your way and you will be able to make out rows and rows of farmland. A number of dhabas will fall on the way where you can stop on the way to treat yourself to some steaming hot chai! It would take you roughly around 6 hours to reach Jaipur, and hence, it is best to start out early. You can visit the Amber Fort and the Hawa Mahal and be back in Delhi by night! Painting it right: Want to try out a really cool activity within the four walls of the city? Have a little bit of anger bottled up that you need to let out? Well, then try Paint Ball! You can try out this really awesome activity at Rockshot Paintball which is located in Pandav Nagar Extension. Do try this one out! For the love of birds: If bird watching is something that you truly and deeply enjoy, then head out to the Sultanpur National Park in Gurgaon. This is one of the best places nearby delhi for short trip. It is ideal if you visit this park during the winters since different types of migratory birds’ flock to this place during this time of the year. It has been recorded that there are almost 250 species of birds here! Flying high:Do you want to see what a bird does when it flies over Delhi? Well then head out to Rocksport in Rajendra Place to try out the adrenaline rush of para sailing. This is a really fun filled activity to try out especially when you are out with your friends. Just make sure that you have got all the security measures in check. It’s all about cricket:If you want to try out something that is typically associated with the life and mood of Delhi, then talk to a few kids in some alleys and take part in the famous gully cricket. It’s really all about the spirit! These are some really fun and unique activities that you can try out when visiting Delhi. Do try them out!